det(A^19) = (det(A))^19 = -2^19 = lambda1*lambda2. The only viable option is D.
Thanks to Matan Mandelbrod for suggesting this solution. Consider the matrix as given below. Which one of the following options provides the CORRECT values of the eigenvalues of the matrix? The Eigen values of a triangular matrix are given by its diagonal entries. We can also calculate (or verify given answers) using characteristic equation obtained by |M - λI| = 0. How many of the following matrices have an eigenvalue 1? This is a numerical answer question of gate paper, in which no options are provided, and the answer is to given by filling a numeral into a text box provided. In the question, matrix A is given as the product of 2 matrices which are of order 3 x 1 and 1 x 3 respectively. 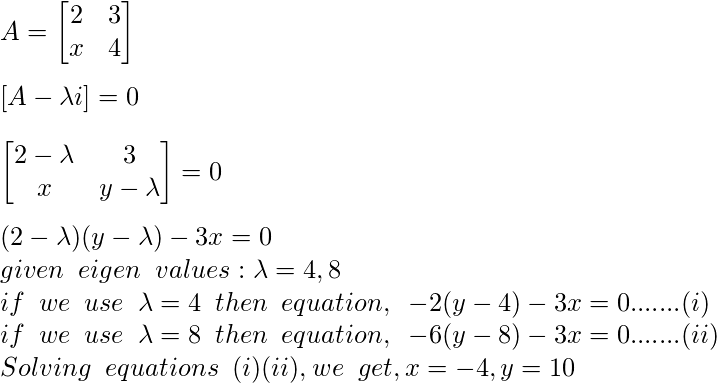 So after multiplication of these matrices, matrix A would be a square matrix of order 3 x 3. So, matrix A is : 2 18 10 -4 -36 -20 7 63 35 Now, we can observe by looking at the matrix that row 2 can be made completely zero by using row 1, this is to be done by using the row operation of matrix which here is : R2 <- R2 + 2R1 After applying above row operation in the matrix, the resultant matrix would be: 2 18 10 0 0 0 7 63 35 i.e. Row 2 has become zero now. And if a square matrix has a row or column with all its elements as 0, then its determinant is 0. ( A property of a square matrix ) Hence answer is 0. Note: Determinant is defined only for square matrices, and it is a number which encodes certain properties of a matrix, for ex: a square matrix with determinant 0 does not has its inverse matrix. The characteristic equation is : | A - zI | = 0 , where I is an identity matrix of order 5. i.e. determinant of the below shown matrix to be 0. 1-z 0 0 0 1 0 1-z 1 1 0 0 1 1-z 1 0 0 1 1 1-z 0 1 0 0 0 1-z Now solve this equation to find values of z. Steps to solve : 1) Expand the matrix by 1st row. (1-z) [ ( 1-z , 1 , 1, 0 ) (1 , 1-z, 1, 0) (1, 1, 1-z, 0) (0, 0, 0, 1-z ) ] + 1. [ ( 0, 1-z, 1, 1 ) ( 0, 1, 1-z, 1) ( 0, 1, 1, 1-z )( 1, 0, 0, 0) ] Note: ( matrix is represented in brackets, row wise ) 2) Expand both of the above 4x4 matrices along the last row. (1-z)(1-z) [ (1-z, 1, 1) (1, 1-z,1) (1 , 1, 1-z ) ] + 1. (-1) [ (1-z, 1, 1) (1, 1-z,1) (1 , 1, 1-z ) ] 3) Apply row transformations to simplify above matrices ( both the matrices are same). C1 <- C1 + C2 + C3 R2 <- R2- R1 R3 <- R3 - R1 result is : (1-z)(1-z) [ ( 3-z, 1, 1) (0, -z, 0) (0, 0, -z ) ] - 1. [ ( 3-z, 1, 1) (0, -z, 0) (0, 0, -z ) ] 4) Solve the matrix by expanding 1st column. result is : (1-z)(1-z)(z)(z) - (3-z)(z)(z) = 0 solve further to get : z^3 ( 3-z ) ( z-2 ) = 0 hence z = 0 , 0 , 0 , 3 , 2 Therefore product of non zero eigenvales is 6. If the trace of the matrix is positive and the determinant of the matrix is negative, at least one of its eigenvalues is negative. If the trace of the matrix is positive, all its eigenvalues are positive. If the determinant of the matrix is positive, all its eigenvalues are positive. If the product of the trace and determinant of the matrix is positive, all its eigenvalues are positive. The trace of a matrix is the sum of the elements of the principal diagonal of the matrix. Fact - The sum of Eigen values of a matrix is equal to it’s trace. Fact - The product of Eigen values of a matrix is equal to its determinant value. Since it’s given that the trace is positive and the determinant is negative, there must be atleast one negative Eigen value. In general there can be an odd number of negative Eigen values in this case since the determinant value is negative. This explanation is provided by Chirag Manwani. Because identity matrix is identity & as they define abc != 0, then it is non-singular so inverse is also defined. The set of matrices is the set of Upper triangular matrices(H) of size 3*3 with non-zero determinant. Along with the multiplication operator the set forms an Algebraic Structure since it follows the Closure Property. This is because the product of Two Upper Triangular Matrices is also a Upper Triangular Matrix. The Algebraic Structure also follows the Associative Property since, multiplication of matrices in general follows the Associative Property. Therefore it is a Semi Group. The Algebraic Structure is also a Monoid, since it has an Identity element, which is the Identity Matrix- I3. The Algebraic Structure is a Group since every matrix in H has an inverse, since every matrix in H is non-singular (given in question). The Algebraic Structure is not an Abelian Group since it does not follow the Commutative Property. Therefore Option A is correct. This explanation is provided by Chirag Manwani. The determinant value of following matrix is non-zero, therefore we have a unique solution. There are 73 questions to complete.